Push-style foam soap dispenser offers a high capacity for educational institutions K-12 so the 2000 ml. system needs to be refilled less often. Lower output is designed for smaller hands. Large sight window makes it easy to check refill level. Soap dispenser uses PURELL FMX-20 2000 ml. 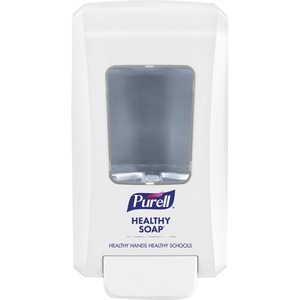 Education Healthy Soap refills. Collapsible, Sanitary PET refill bottle (sold separately) features a removable collar for easy recycling. Lock or Not technology can convert the dispenser to a locking system. With one-handed push operation, it is ADA-compliant. Dispenser is made of durable, ABS plastic with rugged, polycarbonate view windows. Mount it to your wall with included adhesive tape or hardware. Multiple hole pattern allows use of existing wall holes.